During our first full day in Toronto, which was somewhat of a gray, windy and drizzly day, we did a lot of walking around and exploring of various sights in the city. The seasons had definitely changed over from summer to fall, and it was gorgeous walking around downtown Toronto. Being huge hockey fans, and one of the reasons we even traveled to Toronto, we had to check out the Hockey Hall of Fame, so that’s what we spent most of our morning doing. In the afternoon, we wandered over to North America’s only true castle, Castle Loma. By the time early evening was upon us, it was finally time to enjoy an early dinner at a restaurant a few blocks down the street from our hotel room, just around the theater district. Nota Bene, lauded as the “Best New Restaurant” in 2008 when it first opened its doors, serves up a contemporary Canadian cuisine with a bit of a French-Asian flair. At the beginning of 2016, when Chef David Lee became the sole owner of Nota Bene, he re-opened it’s doors with a new concept, design and menu. Born in England, and coming from a French and Asian background, David Lee moved to Canada after many years working throughout Europe in Michelin starred restaurants. 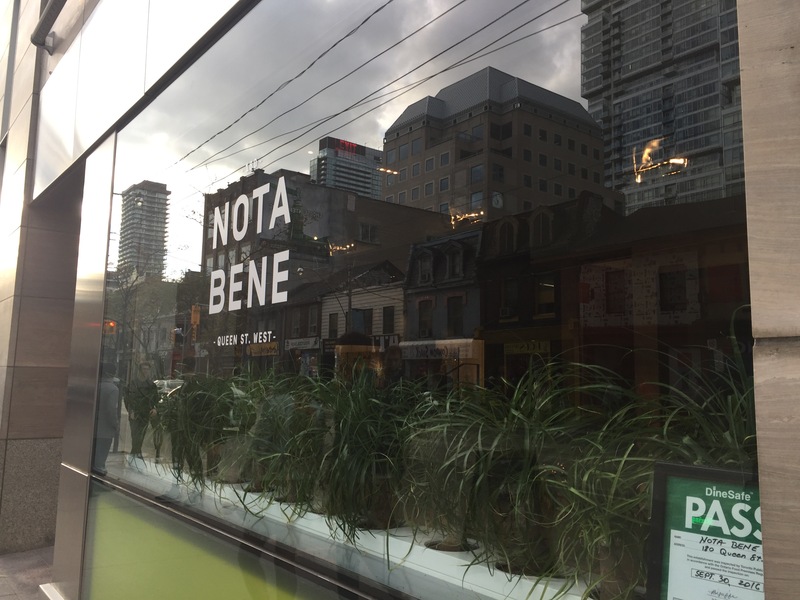 Today, Nota Bene is a representation of Chef Lee’s creativity and unique style, which continues to make Nota Bene one of Toronto’s most sought after restaurants to dine at. The inside of the restaurant features a very modern and contemporary feel with a bit of an underwater feel to it. The space is clean and bright, with decorations of dried coral hanging from the ceilings in an open and comfortable space. It’s actually much larger inside the restaurant than it appears from the outside. The restaurant also features a full bar in the front half of the dining room, and the quiet, intimate dining space in the back half of the room. We arrived early, shortly after the restaurant opened, and before the theater crowd really started arriving, so we had the restaurant nearly to ourselves for most of our dining experience, which was fantastic. To start off our meals, my husband and I both ordered drinks. For my husband, he chose The Adamson made with basil infused bourbon, Casa Marion vermouth and black walnut bitters. 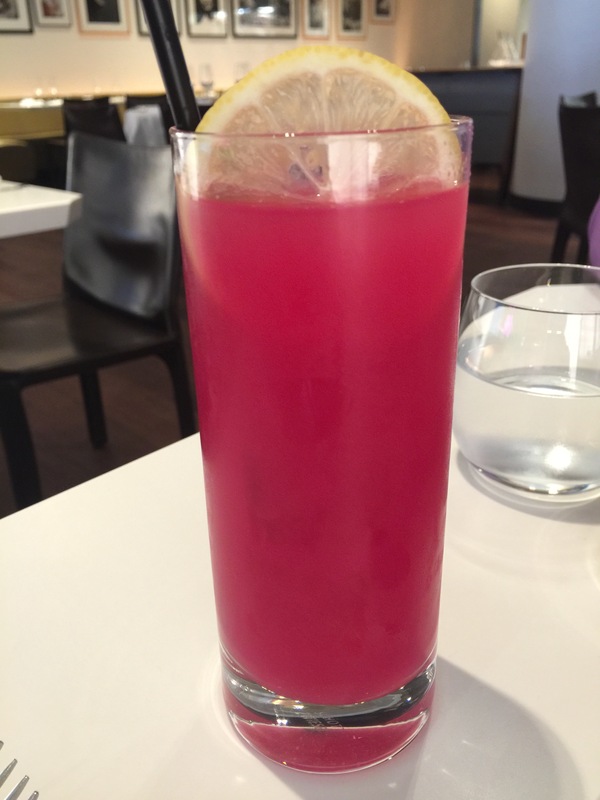 I chose a drink that couldn’t have been more different, the lychee cactus pear juice. 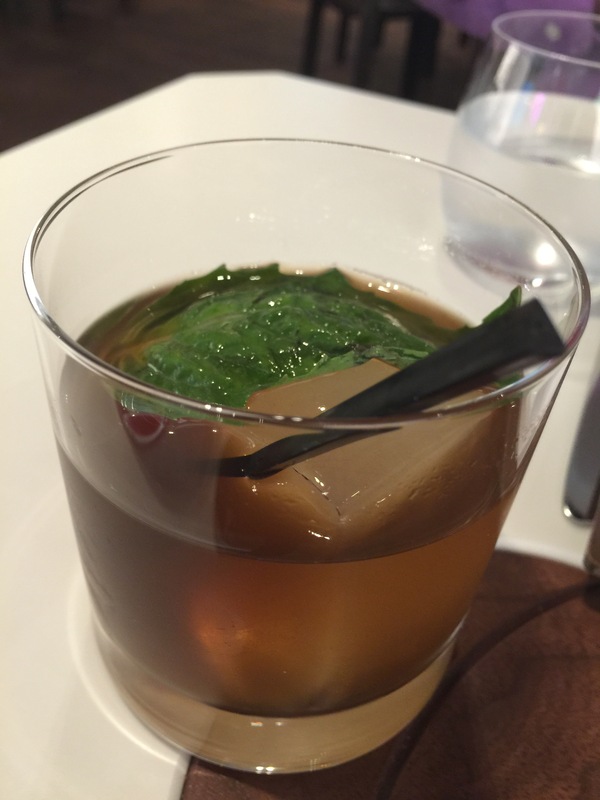 The idea of basil infused bourbon in The Adamson, was intriguing, to say the least. And to bring home the point, there was a basil leaf draped across the ice cube in the glass. My husband said that the drink really had a strong basil aroma, which I could definitely smell, but that the taste of the basil in the drink itself was quite minimal. The drink was nice and strong and very reminiscent of of an Old Fashioned with a little twist. However, my husband did say that the longer he let the drink sit, the more that the basil flavor was infused into the drink. For me, my lychee cactus pear juice might have been the prettiest drink I’ve ever ordered. The bright pink/fuscia color was gorgeous and inviting. The drink itself was fabulous and very light. I loved the sweetness of the lychee that I could taste in every sip of my drink. The cactus pear gave the drink its flavor and was the balance to the lychee mute the sweetness that the drink needed. This was a good start to the meal. As an appetizer, I decided to order the hamachi ceviche. Prepared with coconut, nori essence, Thai basil, mango-chili paste and yuzu, I was slightly concerned that the dish might be spicy. The waiter suggested that I could get the mango-chili paste on the side rather than in the dish, and therefore, any of the potential spice in the dish would be eliminated. The dish was gorgeous and the flavors were amazing. I tried the mang0-chili paste, and while it wasn’t all that spicy since the mango added the sweet to the spice, the dish was just as fabulous without the mang0-chili paste. The hamachi was fantastic and incredibly fresh. The flavors in the dish with the tang from the yuzu which provided the citrus the ceviche needed balanced with the cool, tropical flavor of the coconut, the refreshing earthy flavor of the Thai basil, and the textural crunch of peanuts was fantastic. The dish was refreshing, fresh, and incredibly flavorful. 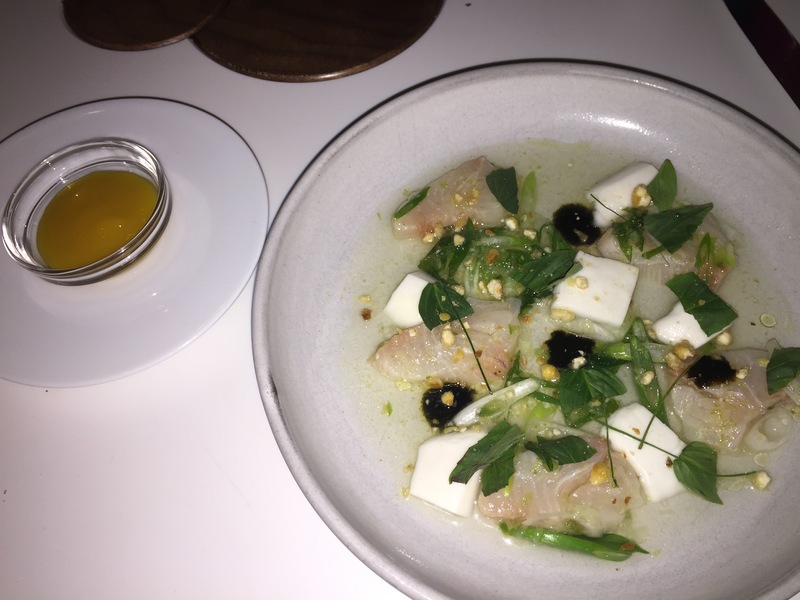 I was slightly hesitant at first about ordering the hamachi ceviche, but in the end, I had nothing to worry about as the dish was just fantastic. As if my husband didn’t have enough foie gras the night before, he decided to order the Quebec foie gras dish for his appetizer. Served up with duck prosciutto, spiced pear, toasted seed & nut crumble and sourdough bread, this dish was the essence of ultra luxury. The dish was colorful and beautifully presented with the foie gras sitting at the center of the plate almost like the sun with the rays of the sun being the pieces of duck prosciutto. 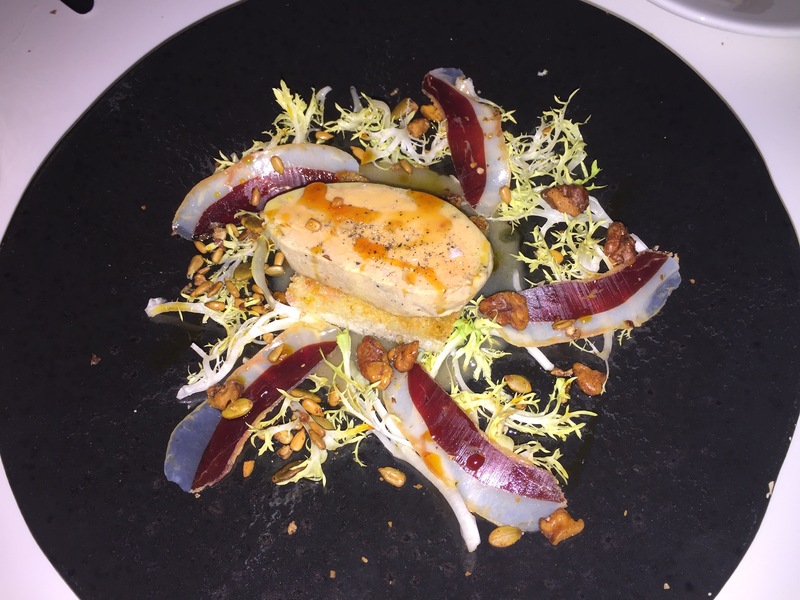 My husband said that the foie gras was like butter and absolutely melted in his mouth. The duck carpaccio, which neither of us had ever seen on a menu before could only be described with one word, “wow!” The dish was rich and delicious and yet light with great flavors that just combined together so well. The nut crumble added crunch and the greens added a bit of freshness and earthiness to balance the richness of the prosciutto and the foie gras. For dinner, my husband ordered the ricotta ravioli topped with shaved black truffle, parmigiana and chives. It was the idea of shaved black truffle that put the dish over-the-top for my husband and he just couldn’t resist. After all, he’d already had foie gras and duck prosciutto, why not finish off the meal with some black truffle. 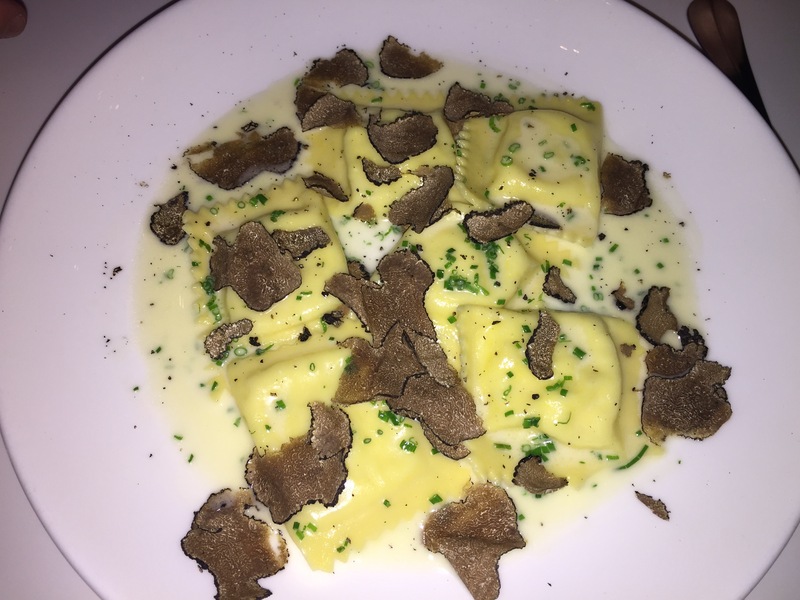 Of course, the truffle was served with ricotta ravioli, and anything stuffed with cheese is always going to be a winner in my husband’s book. The dish was fabulous, but would you expect anything less? The flavor combination of the ricotta and the truffle was a perfect combination. And believe me, the restaurant did not skimp on the shaved black truffle at all, there was truffle in every single bite. The ravioli’s were like fluffy pillows that were perfectly stuffed and cooked. This dish may have lacked protein, but it was filling and rich none the less. 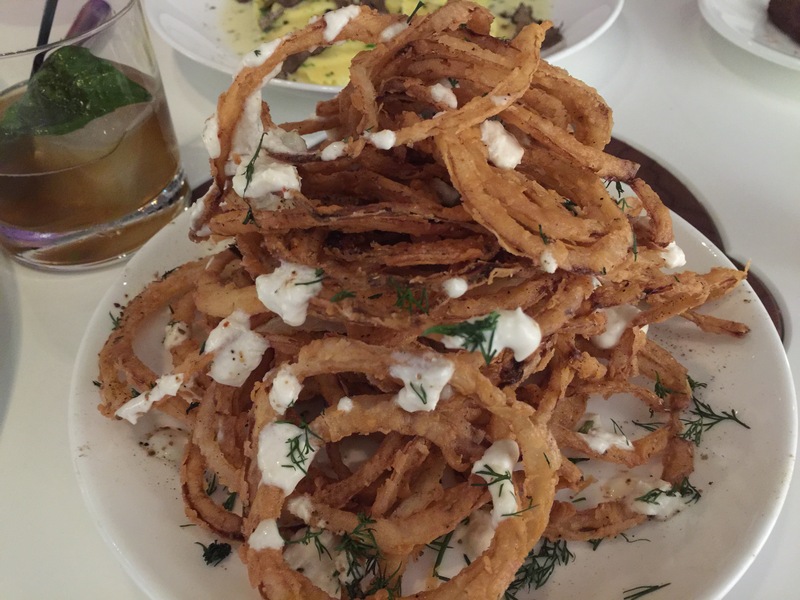 As a side dish to go with our dinner, we ordered the shaved onion rings with horseradish creama and dill. Light and crispy these onion rings were superb. Cut thin and lightly battered, the rings were deep-fried to a golden brown and stacked high on the plate. To finish it off, the onion rings were then drizzled with a horseradish creama and chopped dill. The creama was fabulous and really made the dish. The flavor of the horseradish was strong and really opened up your senses with quite the bite, but that’s how my husband and I love our horseradish. The dill added a great herbaceous flavor to the dish. My husband and I absolutely loved how simple, and yet how terrific this dish tasted. It was a fun and whimsical side dish to accompany our meals. I figured seafood would be a good option for my dinner, so ordered the wild sea scallops and side stripe prawns. 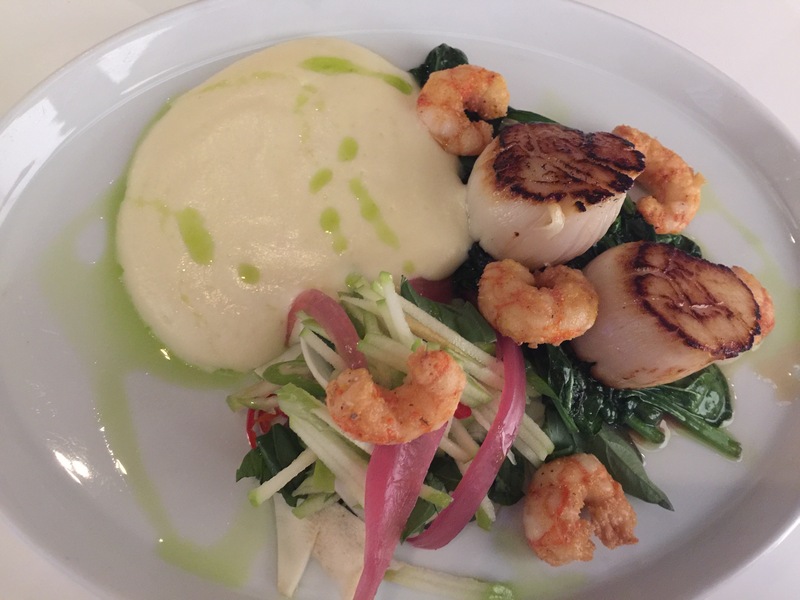 The seafood was served with apple & celeriac salad, smoked bacon pommes puree and green onion. The wild sea scallops were perfectly seared with a beautiful caramelization on the inside and sweet tender meat on the inside. I absolutely loved the flavor of the scallops. The side stripe prawns were a good accompaniment and actually a good pairing with the apple and celeriac salad which had a nice tang from the Granny Smith apples and a terrific crunch to balance the tenderness of the seafood. And one of the best flavors of the dish was the smoked bacon pommes puree. With each bite, you could definitely taste and smell the smoked bacon, and the flavor permeated throughout the smooth puree. The texture of this puree was almost unlike anything I’d ever had before, and with the flavor of the smoked bacon, I was hard to even remember that I was eating potato puree or a fancy form of mashed potatoes. The dish was filling and delicious and everything I could have asked for when I ordered this dish. By the time dinner came around, we were both a little full, but we’re also never one to say no to at least taking a peek at the dessert menu. After a quick perusal, we actually each decided to order our own dessert. Luckily, the desserts were pretty small, so we were both able to finish our desserts. 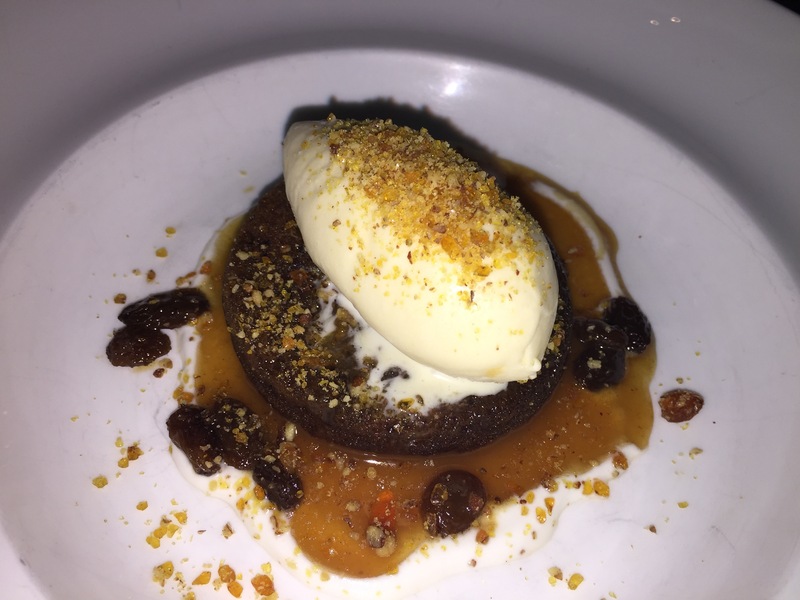 My husband ordered the sticky date pudding with pecan praline, rum raisins and brown butter ice cream. Raisins and date pudding are definitely not my choice, but my husband really enjoyed his dessert. After one spoonful of the sauce and the a taste of the rum raisins, my husband’s first words were, “whoa!” My husband said that after a few of these rum raisins a person could get drunk off of them, in other words, the flavor of the rum was very strong. For him, it was awesome. The combination of the pudding and the light sweetness of the dates along with the cooling effect of the brown butter ice cream, which was rich and creamy was a perfect combination. The dessert wasn’t overly sweet, which is exactly the kind of dessert that my husband looks for. For my finishing dish, I ordered the molten chocolate cake. Chocolate cake and sweet dessert, this is exactly up my alley. Served with milk chocolate ice cream, amarena cherries, white chocolate ganache and salted pecans, this dish was certainly very sweet. 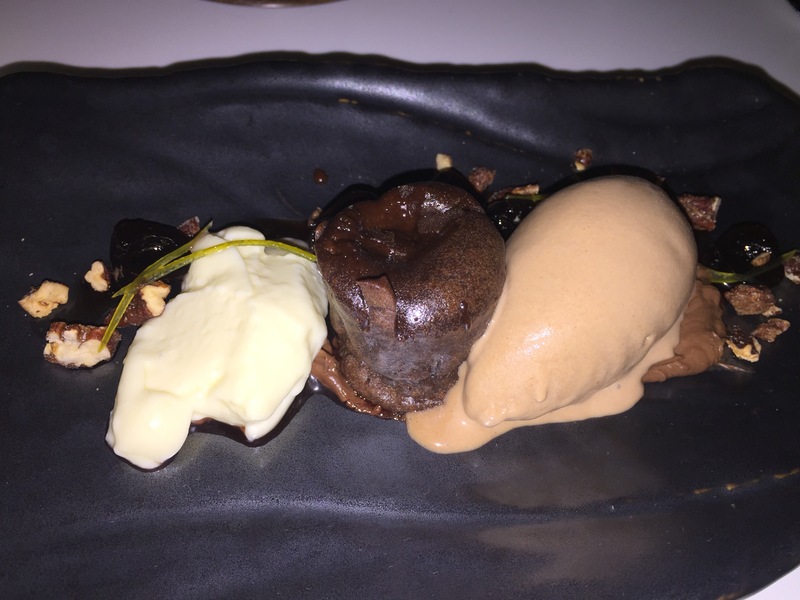 The presentation of this small molten cake surrounded by ice cream on one side and white chocolate ganache on the other side on a black slate plate was very pretty. The molten cake had obviously just come right out of the oven, and the milk chocolate ice cream was just starting to melt from the heat emanating off of the molten cake. I loved that the white chocolate ganache wasn’t too sweet, as it balanced out the sweetness of the melting chocolate coming out of the cake. The milk chocolate ice cream balanced it all out and added the cooling, refreshing flavor. The salted pecans added crunch and just a hint of salt to make this a salty, sweet dish. I’m not a cherry fan, so I left the amarena cherries alone. After a large and filling dinner, this smaller dessert was just perfect. Our dinner meal at Nota Bene from the first drink, all the way to dessert, was scrumptious. The service was fantastic, and the atmosphere was intimate and relaxed and perfect for what we were looking. Every dish was flavorful and well prepared and presented, the flavors melded together well and there was just enough creativity to make our dinner stand out. The location of Note Bene, right in the heart of the theater district also makes it an ideal place to dine before and after any theater show. 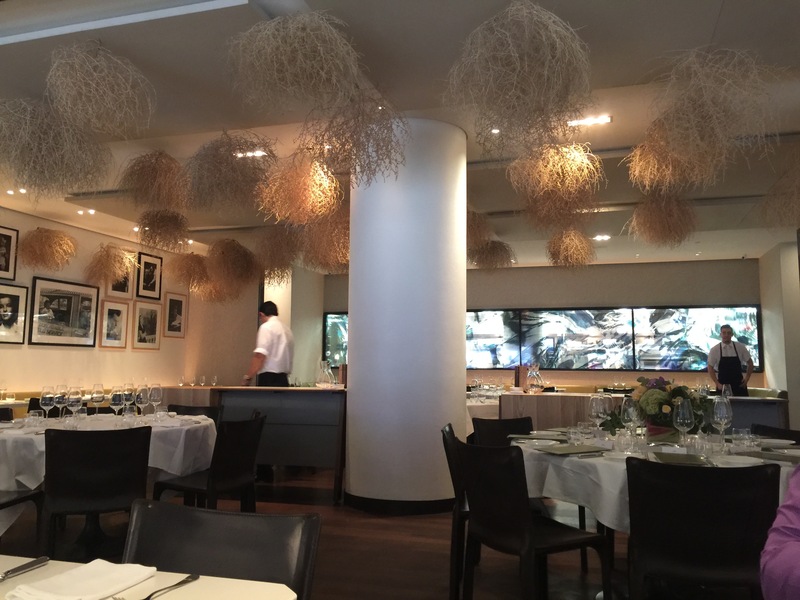 Again, it’s easy to see why Nota Bene is so highly acclaimed and is listed as one of Toronto’s top restaurants.